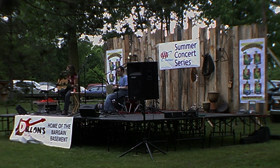 All went well with the first annual Cornstock Music & Arts Festival. Lots of people (the photos are misleading), fair amount of artists, decent food, good music. All in all a success. The banners and t-shirt design I created were printed really well. 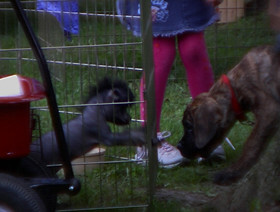 The dog with a mowhawk (shown above) - I didn't realize it but the dog with the mowhawk was for sale. He sold very quickly because I went back to get a better photo and he was gone. The Chainsaw Carver - I saw people buying a decent amount of his work. 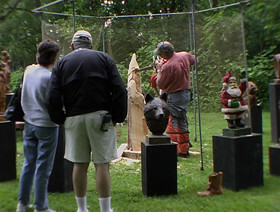 The photo above depicts the artisan sculpting some sort of wizard character. I shot some video footage that I may post at a later date. Overall it was a mellow affair. Good excuse to be outside. Looks like a cool event. Will try to attend next year.